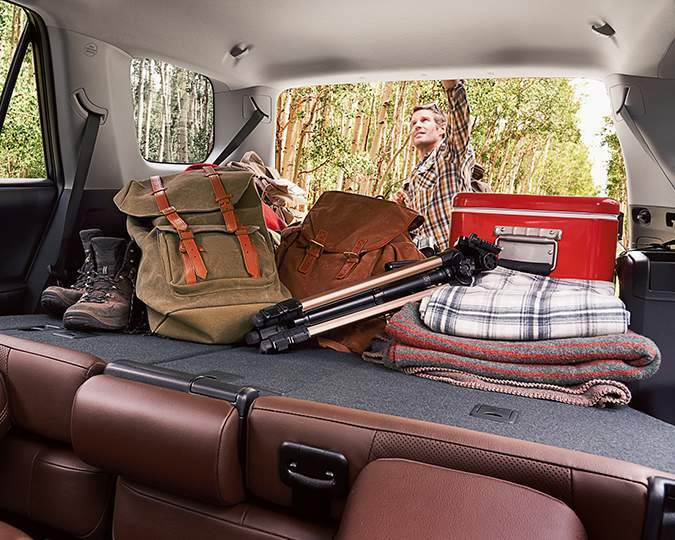 Ready for anything under the sun, the 2018 Toyota 4Runner is the perfect sidekick for life’s adventures. Available in a single trim level for this model year, the Toyota 4Runnner offers an array of packages to make it your own, including Standard Package, TRD Off Road Package, Limited Package (5-Passenger), Limited Package (7-Passenger), and TRD Pro. Whether you require 5- or 7- passenger seating configurations, you can get a head start on the journey behind the wheel of this 4-door SUV. 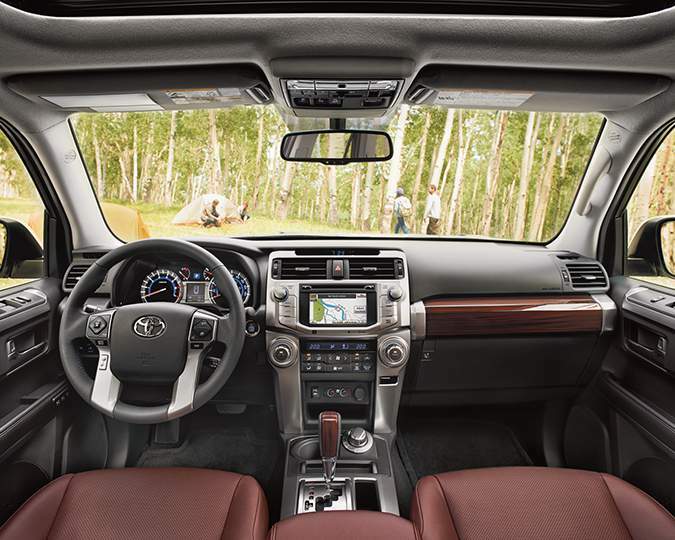 As one makes their way inside the 2018 Toyota 4Runner, drivers marvel at the incredible technology and luxury throughout the spacious cabin. Bluetooth, voice recognition and steering wheel controls make things effortless, allowing you to keep your focus on the road. Comfort is achieved through standard features such as air conditioning; dust, pollen, deodorizing air filter; rear seat heater ducts; SofTex Leather seating surface; heated front seats; and so much more. Take things up a notch with available features such as dual-zone automatic climate control, push-button start, heated and ventilated front seats, TRD Pro shift knob, and TRD Pro badged floor mats. As you pan around the 2018 Toyota 4Runner’s sculpted exterior, it is clear it was meant for the road. Both 5- and 7-Passenger Limited Packages feature available chrome touches such as chrome door handles, chrome body side mouldings and chrome grille, which prove this SUV was made for both the city slicker and off-road adventurer. TRD Pro models are exclusively equipped with a TRD-Stamped aluminium front skid plate, unique heritage Toyota grille, black accents on front and rear bumpers, and black TRD Pro badging on c-pillar and tailgate. 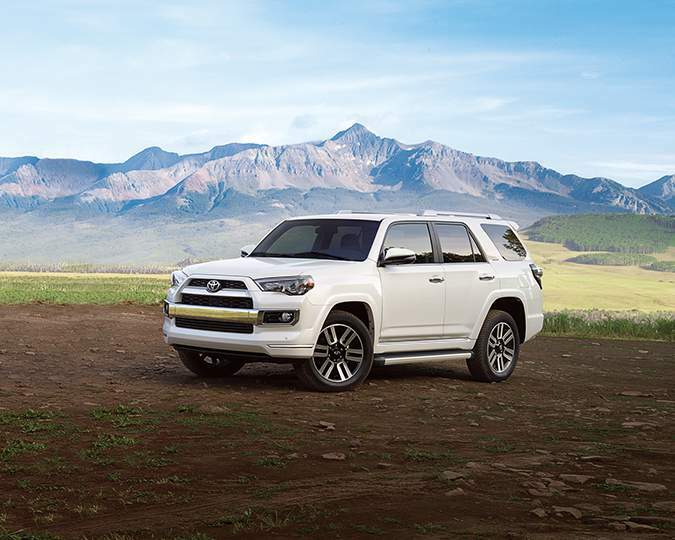 Illuminate the open road with the 2018 4Runner’s standard lighting scheme, which includes projector style halogen headlamps, fog lamps, smoked headlamp surround and black tail lamp surround. To top it all off, towing has never been easier with standard towing equipment such as towing hitch, 4-pin trailer wire harness and 7-pin trailer wire harness. Ready to keep you and your passengers entertained, the 2018 Toyota 4Runner offers a vast array of standard equipment, including a 6.1-inch display screen with voice recognition, AM/FM/CD/MP3/WMA capability and SiriusXM satellite radio integration, navigation, SMS-to-speech and Email-to-speech, and more. Upgrade your 4Runner’s audio system with the Limited Package’s JBL Audio with 15 speakers and subwoofer. Or opt for AVN Premium Navigation, available only with the Limited Package 7-Passenger. Regardless of your wants and needs, you can expect nothing less than the best with Toyota technology. When it comes to your 2018 Toyota 4Runner, trust the experts to install Toyota genuine parts and accessories. Toyota Genuine Parts allows drivers to select the Toyota products they really want, without the hassle. Whether it’s simple items like oil and filters or coolants and cleaners, to parts like batteries and belts or brakes and tires, or even a windshield, drivers have come to trust the Toyota Genuine name. For a little 4Runner flare, look to Genuine Toyota Accessories, which is also host to Toyota Racing Development (TRD) performance and appearance products. Featured accessories for the 2018 Toyota 4Runner include a Toyota Genuine Dash Camera, Hood Deflector and Plug-In Block Heater. Under the hood of the 2018 Toyota 4Runner lies a standard 4.0L, 6-cylinder engine. 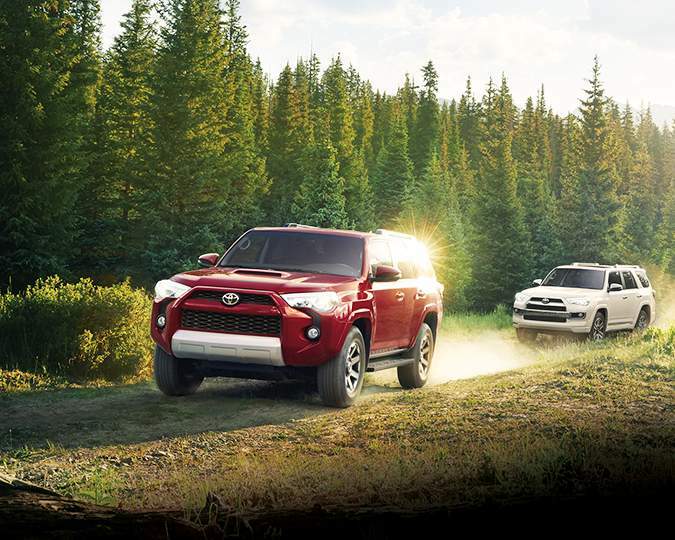 Mechanically inclined, the 4Runner offers standard performance features such as 4WD Part-Time, Active Traction Control (A-TRAC), and Trailer Sway Control. TRD Off Road and TRD Pro packages offer exclusive features such as multi-terrain ABS, multi-terrain select, and 4-wheel crawl control. The Limited Package 5-Passenger and Limited Package 7-Passenger offer 4WD full time, and X-REAS sport suspension. TRD Pro models offer TRD Bilstein High-Performance Shocks with rear remote reservoirs, TRD-tuned front springs, and 31.5″ Nitto Terra Grappler All-Terrain tires. The Toyota 4Runner features a towing capacity of 2,268 kg. Award-winning safety, dependability and value, the 2018 Toyota 4Runner is part of a great legacy. Loaded with Toyota’s Star Safety System, the 2018 Toyota 4Runner offers a vast number of active and passive safety and security features. Toyota protects its drivers with a comprehensive Warranty and Roadside Assistance package with every new Toyota and vehicle including the 2018 Toyota 4Runner. Rugged, sculpted and raring to go, the 2018 Toyota 4Runner is ready to be configured for your next adventure. Enjoy the journey like never before with an array of standard and available options. With two Toyota Racing Development (TRD) Packages to choose from, there’s no telling where this SUV will take you. Take the road less travelled with the new or used 2018 Toyota 4Runner, available at Gateway Toyota. Your local Edmonton Toyota Dealer – Gateway Toyota offers the latest from Toyota Canada, along with a wide selection of pre-owned cars, trucks and SUVs. With fleet and financing options also available, there’s no telling where the road will take you.